Great article. I visited Washington two weekends ago, and spent a lot of time in a neighborhood directly south of Columbia Heights, around 14th street and Avenue P. It appears totally gentrified now, with doorman buildings, many bars and restaurants---a poster describing the changes in the area told of how in the late seventies, gritty neighborhood residents fought to transform a high crime neighborhood into a solid one. But now, the area seems to simply existt for one class of person. Like the writer of the article, the changes make me feel more at home as a visitor, but at what price....? Great article. I can attest to the fact that I used to visit and be scared to take a wrong turn, but now I'm scared to order the wrong microbrew. One striking incident that underscored the pains of gentrification was the rash of a few armed muggings right by the metro stop immediately after the mall opened. It was a clear illustration of the complication of dumping money and development into a changing neighborhood. 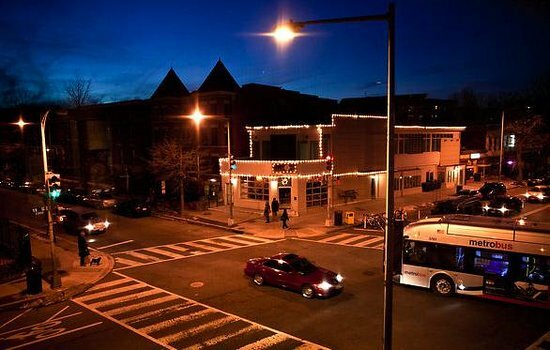 The new Columbia Heights is very "nice", but for whom, and what does that mean?